Los Angeles-Ohio State had been running around the Big Ten for the past two years as the Big, Bad Wolf, going undefeated last season in Urban Meyer’s first year as head coach of the Buckeyes’ football program. Year 2 proved to be an encore for the Buckeyes-that is until they ran up on the Michigan State Spartans in their annual Big Ten showdown. All Ohio State, which was the No. 2 ranked team in the country at the time, had to do was win out and follow their destiny to the BCS Championship game. Michigan State wasn’t having any of that. With hype surrounding college football’s final weekend of the regular season, Michigan State decided to tip over the apple cart by beating Ohio State. That sent Buckeyes’ fans reeling and gave the Spartan faithful an opportunity to book a flight to Pasadena and maybe get some sun time in with Mickey and friends and Disneyland. The Spartans got a chance to send some time at Disneyland on the first day to kickoff Rose Bowl week. Now it’s time to get back to business for the Spartans, which spent the morning on Saturday fielding questions from reporters and then taking the field for practice. 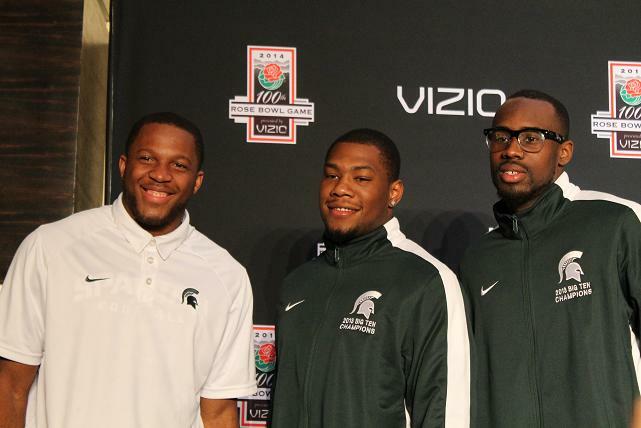 Of course, there is more to come for the Spartans with Rose Bowl Media Day. In the Big Ten title game, the Spartans served notice that they can ball with any team. If the Spartans jump out for a double-digit lead against Stanford (17-0) as they did against Ohio State, the Cardinals might be in some trouble. Three of the Spartans’ top playmakers-running back Jeremy Langford, wide receivers Benny Fowler and Tony Lippett, talked about the mindset of the team going into that game. Langford, who rushed for 128 yards against Ohio State, said the game was about going out and getting the win. Fowler said the team wanted to end the season on a high note. Lippett was a bit more blunt about assessing the game.